Is it or is it Not Dangerous to Your Health ? Why test? Mold can be invisible and be impossible to smell, yet dangerous to your health, especially to anyone with any respiratory issues. The more time you spend in a mold affected environment the more it breaks down your bodies resistance, making you more susceptible to its ill affects. 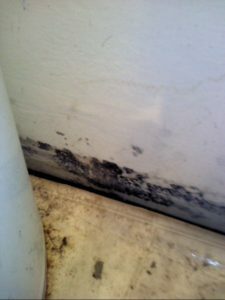 Mold is a spore that is naturally occurring in nature. All molds are not considered bad and many molds like the mold found on older bread does not affect most peoples health. 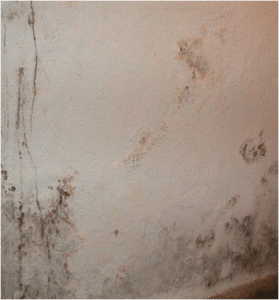 Mold is a bacterial growth caused by excessive moisture in the air or on a surface. Once mold gets into a home it can be hard to eradicate it, the source (moisture) has to be identified and removed, the place dried out and the mold mitigated. Since all molds are not hazardous to your health it can be confusing, mold that is black in color is not necessarily “black mold”, and mold that is grey is not necessarily harmless. The mold that most people fear is Stachybotrys chartarum which can be very bad for you health especially if you suffer from any respiratory issues. 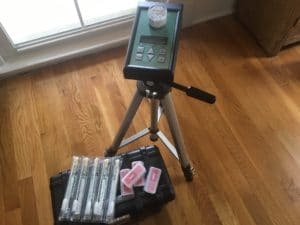 The only way to know if mold you have seen is in fact dangerous is to have it tested. Any home that may have had a serious water leak should be tested for mold particularly is there is a “funky” smell or odor in the house. We can take air and swab samples as well as tape lift samples, and overnight them to the lab for analysis. The detailed report will break down the various mold types in the sample as well as giving you information about their health affects of each type of mold found. For a test that is not being done in conjunction with an Inspection, there will be a trip/ consultation fee added to the sample fee.